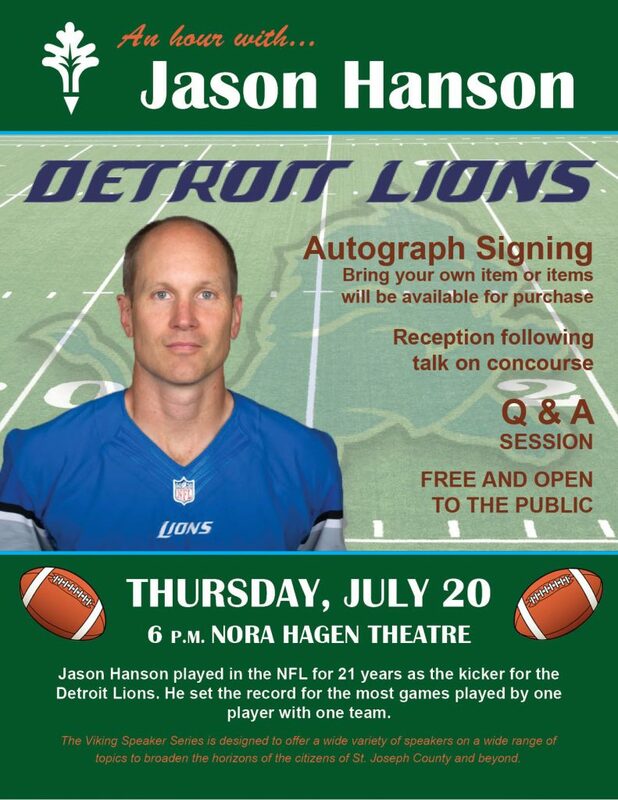 Glen Oaks Community College will host Jason Hanson, former Detroit Lions kicker, the first speaker in the 2017-18 Viking Speaker Series. The event will be held on Thursday, July 20 at 6 p.m. in the Nora Hagen Theatre on the campus of Glen Oaks Community College. The event is sponsored by Sturgis Media Group and Glen Oaks Community College Foundation and is free and open to the public. Hanson was drafted by the Lions in the second round of the 1992 NFL Draft out of Washington State University. He played in the NFL for 21 years as the kicker for the Detroit Lions. Retiring in 2013, he set the record for the most games played by one player with one team. There will be a reception following his talk on the concourse where he will sign autographs. Participants are encouraged to bring their own items for him to sign. In addition, there will be items available for purchase. Born in Spokane, Washington, Hanson graduated from Mead High School where he lettered in football, basketball and soccer. As a senior, Hanson won All-Greater Spokane League honors as both a kicker and punter and was named a first team All-State honoree by the Washington Sportswriters Association. In the classroom at Mead, he maintained a perfect 4.0 grade point average. Hanson was named the 2002 recipient of the Detroit Lions/Detroit Sports Broadcasters Association/Pro Football Writers Association’s Media-Friendly “Good Guy” Award. The Good Guy Award is given yearly to the Detroit Lions player who shows consideration to, and cooperation with the media at all times during the course of the season. The Detroit Lions inducted Hanson into the Ring of Honor in fall 2013 at Ford Field for his success and dedication to Detroit Lions football. Area high school football coaches and teams have been invited to participate in this event. The Viking Speaker Series was recently reinstated as one of College Council’s initiatives and the hope is to offer a broad range of topics and bring diverse speakers to campus. Parking for the event is free.